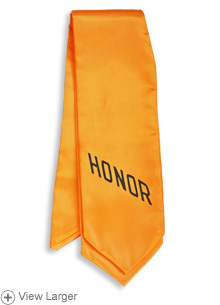 Bring recognition to your honor student with this imprinted gold honor stole! The stole is contoured to fit around the neck and lie flat in front, with Honor imprinted on one end. Made from high-quality satin, the stole hangs down 28 inches from the mitered point at the back. From Anonymous of Reston, Virginia on 5/11/2016 . From Anonymous of Caddo Mills, Texas on 4/15/2015 .